If you’re looking to re-fuel after a hard morning’s shopping, or a place to catch up amongst friends over a light lunch, then look no further then Tibits. Be tempted by meat-free dishes served within a contemporary 1920s décor this summer. Tucked away on a cobbled square just behind Regent Street, lies a trendy vegetarian eatery. Founded by three Swiss-born brothers, Tibits, combines convenience, in that you can have food to go, with delicious dishes and modern surroundings. With the ideology that consumers should have control over what they eat, how much they eat and how much they pay, this family business provides customers with the option of creating their own meal from a selection of tasty dishes via a weekly rotating menu. The cheese stuffed jalapenos is certainly a dish to be recommended, as well as their delicious cheesecake. Who knew this traditionally creamy dessert could taste so good with low fat substitutes? Once you’ve entered Tibits, you quickly understand that it isn’t a formal restaurant. That of course does not take away from their decadent, 1920s-inspired interiors. Tibits exudes the comfort of being at home with Grandma, where all the dishes, from starters to mains to desserts, have been prepared for with care and some consideration of your health. Yet unlike at Grandma’s you enjoy your meal within contemporary opulent surroundings, and there is of course a bill to take care of. Price at Tibits is determined by weight, so you can eat as much or as little as you like. It is this type of flexibility and freedom which explains why this restaurant has experienced great success at home in Switzerland. And having launched their first UK eatery in 2008, Tibits has secured itself as the go-to venue for light tasty vegetarian dishes. So much so, you may find the odd celebrity or two tucking in. With a beautiful outside eating area that perfectly matches their muted luxury interiors, you can enjoy your uniquely refreshing meal whilst sitting on a decadent wicker chair as the breeze gently cools the sun’s warm rays. Warmer weather is predicted to stay with us for a little while longer so dining outside, particularly at Tibits, is the perfect way to enjoy a meal. If you don’t fancy eating in, there is always the option of a take away. So you can indulge from the comfort of your own home. 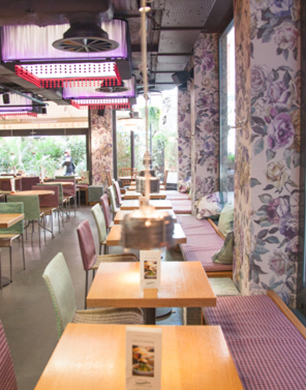 Proving that you can “enjoy vegetarian food, while still exuding contemporary and fashionable style”, as quoted by Reto Frei co-founder of Tibits, it comes as no surprise that this trendy restaurant is one of the most popular vegetarian eateries in London. And will probably continue to be so in years to come. Save yourself time scouring the streets of the city centre and head down to Tibits for a tasty convenient, veggie lunch, al fresco style. Make sure you think sicily when booking holidays this summer.